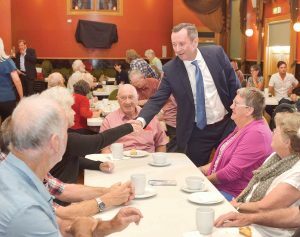 WA Premier Mark McGowan chats with local residents at a ‘meet-and-greet’ morning tea in the Toodyay Memorial Hall last month. WA PREMIER Mark McGowan has announced two State grants totalling $1.79 million to help build new sports facilities next to a long-awaited public swimming pool on shire land near Toodyay District High School. The funding announcement coincides with a Shire of Toodyay call for local contractors to register for work on the $12 million project, which is expected to significantly boost local employment during construction. The latest funding announcement is in addition to last year’s Federal grant of $4.7 million and represents a “best case scenario” mapped out by the Shire of Toodyay in December 2017. 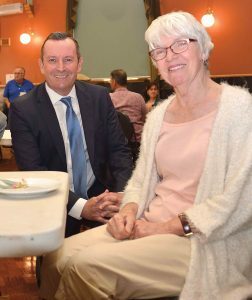 The Premier visited Toodyay last month to make the announcement at an official civic gathering at Newcastle Gaol Museum before joining about 80 local residents for morning tea in the Memorial Hall. He also visited the Toodyay RSL’s new Clinton Street premises to inspect plans to convert the former shire gardening depot into a sub-branch headquarters, which the Premier was told requires initial funding of $10,000 to get the building project started. Last month’s funding announcement consists of $900,000 from the State Government’s Community Sporting and Recreational Facilities Fund and a WA Lotterywest grant of $890,000. The Premier said he grew up in rural NSW where similar projects were funded by poker machine revenue. “I’m very pleased that in WA we don’t need pokies to pay for better community facilities – this is a much better way to do it,” he said. Mr McGowan began his Memorial Hall address leading the audience in singing Happy Birthday to local volunteer Desrae Clark (left). He said the grants were for a new multi-purpose sports pavilion, tennis, netball and basketball courts, and a new rectangular playing field with floodlights for hockey, soccer and rugby. The shire publicly advertised last month an intention to borrow up to $4.5 million from the State Treasury to help build the new $12 million sport and recreation precinct, including a 25m swimming pool. Last month’s funding announcement reduces required borrowings to $2.7 million and cuts annual costs to $319,000, according to the shire’s best-case scenario. Mr McGowan said Toodyay’s new precinct would become a hub for a range of local sports, provide a timely upgrade of local sporting infrastructure and help foster a healthier, more-connected community. “Grassroots sport is the cornerstone of country communities like Toodyay, and my government is proud to help deliver this important project,” the Premier said. Mr McGowan congratulated Shire Community Development Officer Debra Andrijich – who won this year’s Australia Day Toodyay Community Citizen of the Year Award – for writing the successful grant applications. Local Labor MP Darren West said Toodyay was a growing community – the new sports and recreation project was vital to accommodate further growth into the future.